I love old buildings. Waaaaay back when we had tv, one of my favorite shows was If These Walls Could Talk. I love to imagine all the things a building has seen. Recently I took this picture from the top of Center in the Square. 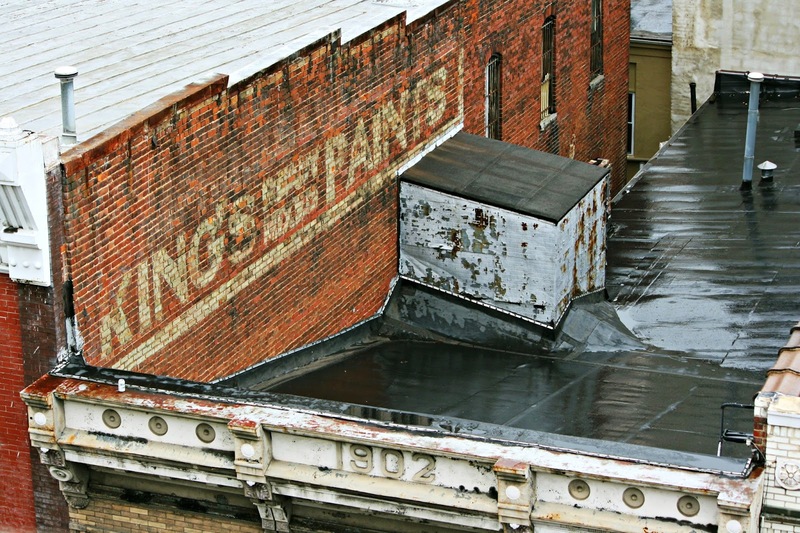 I liked the King's Paints sign on the brick building. 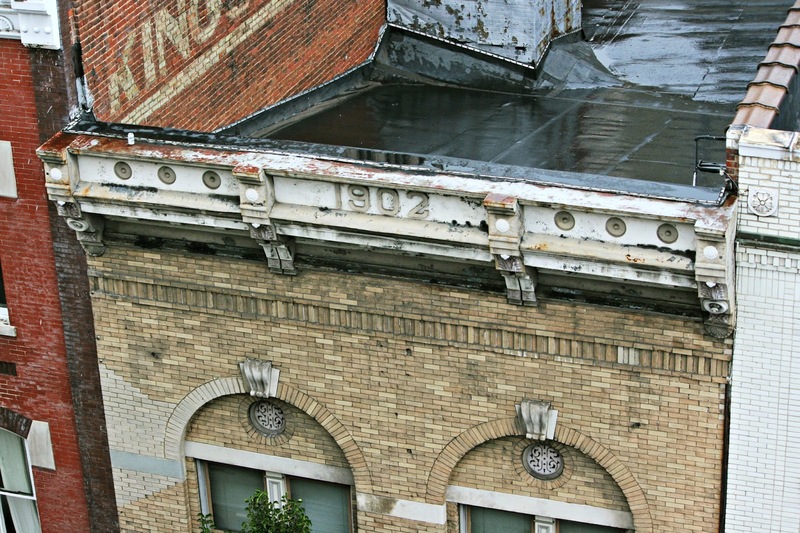 And I couldn't help but wonder if anyone ever slid down the roof of the 1902 building. Linking up tomorrow with Rubbish Tuesday. I love the look of old buildings like this. We have this type on our small town square. I love those old buildings downtown. I'm sure there are many nefarious stories there. Roanoke was a very rowdy place at the turn of the century. I can totally see some teens sliding down that roof! Great photo. That does look like a cool place to slide. I like old buildings too, especially with the old red bricks. The painted signs are real unique. Is the paint company still in business? I love old buildings too, it does look like a super slide and I imagine someone has tried it. I'm particularly fond of the faded old fashioned publicity on the sides of buildings and homes as well...these are great shots. I love the "old" buildings. So much character! That WOULD make a really good slide. Had it been raining or is it always that shiny? You share the very best stuff . . .
yes, that looks like a place kids would delight in finding - and parents would live in fear of that discovery . . . I remember that show. I liked it too. I was there but didn't notice the sign, I will have to look closer next time! Looks like your typical old time Southern town there. Red brick buildings, and all old. BECAUSE THEY COULD TALK TO YOUR HEART. IMAGINATION IS THE KEY FOR DREAMING. this old building totally cool. love your perspective on the images and yes the roof looks great for sliding. I also love seeing the old signs painted on brick walls!!! What a great view you had of the tops of those buildings. That one definitely would make a good sliding place!!! Neat photos! Love the faded sign. A really interesting view of the old building. I like the detail at the top just under the roof in the second pic. Love old buildings and I am delighted to see that many are being renovated. Our local historical society has bought two old downtown buildings and has filled it with antiques. They replaced windows and painted the old brick. It's nice to see. I love the way they used to put the date on the buildings. That building has a charm all it's own. Nice. oh this is great, where is it? i haven't seen that show, i wonder if it is on netflix, sounds like something i'd love! I have a feeling lots of people slid down the roof! I can see teenagers loving to slide down that roof! I imagine many a Mom was frightened at the sight (or thought) of her kids sliding down. It seems so perfect. Some old buildings I like. Others can creep me out. My husband gets disturbed by empty factories. I enjoyed that show also. And I bet some youngsters and adults alike slid down that roof. I adore all that old brickwork!